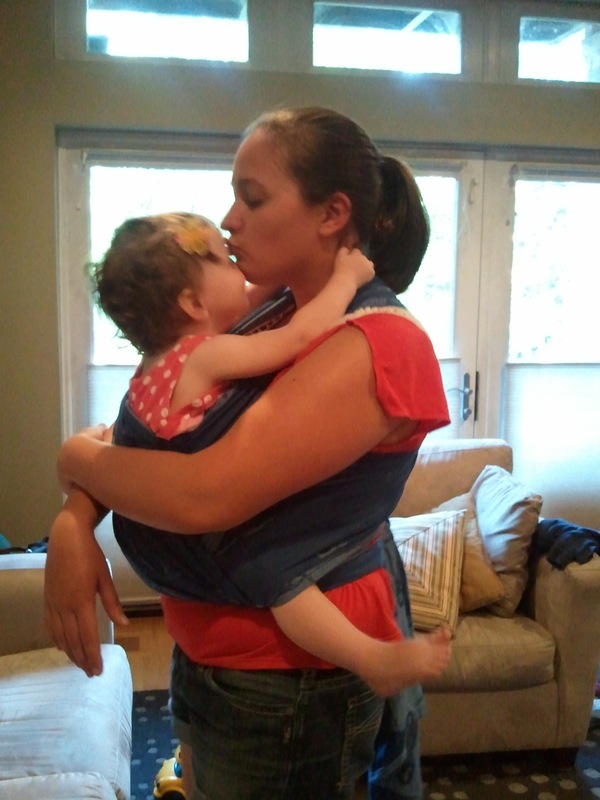 This is my 11th installment of Babywearing Stories 365. Each installment features a babywearer in 1 photograph and their answers to 5 questions. My goal is to normalize, promote and celebrate daily Babywearing, moving beyond *what* we use to carry our babies and shifting focus back on *why* and *where* we carry. I hope to share the stories of moms, dads, and babywearing caregivers all over the world. Enjoy! I am a Certified Professional Nanny who loves to babywear! The little girl I watch is my main wearee (now 2), but I wore her 3.5yo brother a lot this past winter. I’ve been wearing her since she was a newborn, and love every minute of it. This picture was taken by my sister who had come over for a playdate last summer. In this photo, I am on the job! This is the family’s house where I work. I have spent a lot of time wrapping, buckling, and tying baby into a carrier there before heading out on our adventures. In this picture I am using my old Didymos Nino in a FWCC (front wrap cross carry). It took me awhile to get the hang of wrapping, this photo was taken after a great success! It felt great to finally get a good carry after trying so hard and long. Eventually I realized that the Nino wasn’t for me, and I sold it. It was bittersweet to say goodbye to my first wrap – the one I got such great cuddles in, but the funds bought me another wrap that I love way more. Now, I have somewhere in the realm of 30 carriers (various types), and I am in the process of a destash to make room for more! I don’t remember my rationale for babywearing at that particular moment. I probably just wanted the wrapping practice ;). I started babywearing in the first place out of necessity. With two under two, and my only mode of transportation being public transit – I needed a way to navigate the city that wouldn’t get in the way of commuters. I quickly fell in love with wearing though. It is so convenient, so sweet, and it lets you share your love with the sweet baby on your chest.